Engineers Without Borders is an international organization with chapters around the world. At the Faculty of Agriculture, Food and the Environment of the Hebrew University, the chapter is working on sustainable agricultural development. 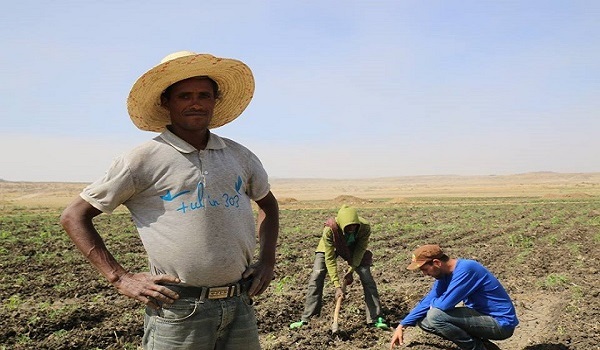 Its project in Mekelle, Ethiopia, is working towards improving the agricultural knowledge and capacity of local farmers. The project focuses on improving agricultural yields through improved irrigation methods, hybrid seeds, fertilizers, pest control and improved agrotechnical methods. At the demonstration site last year, they grew tomatoes, onions, and lettuce and produced yields 10-fold that of adjacent farmers. The project is a joint effort together with The Tigray Development Association, Mekelle University, the Tigray Ministry of Agriculture and the local Branch of Engineers Without Borders. The chapter is composed of students, researchers, and alumni. In the next few years they aim to build several demonstration sites across Tigray, Ethiopia, training and work with small land holding farmers, develop an agronomy internship program for graduates of the Faculty of Agriculture at Hebrew University and from the dryland agriculture college at Mekelle University, and work together with students at the high school and university level to demonstrate the science of agriculture.